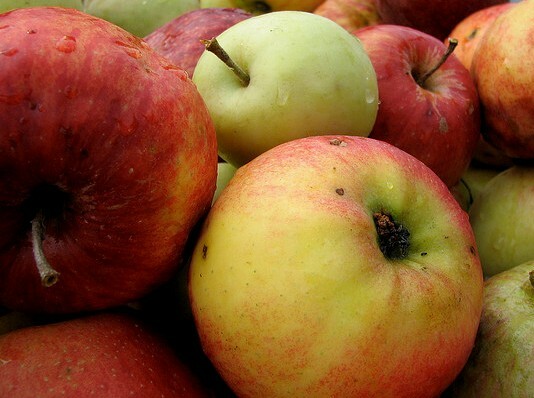 Expectations this autumn for a decreased harvest of apples in Massachusetts echo similar forecasts from a century ago. In 1901, the pronounced decline in the local production of cider apples was noted, as was the consequent increase in price of the fruit. Cider apples in Middleboro have advanced to ten cents a bushel, while down in Nova Scotia the same grade of fruit is rotting beause it is so plentiful. The apple shortages of recent years are a strong argument for a reduced duty on the Canadian article. 1901, in fact, marked a low point in annual production with only 23,075,000 barrels produced, down from the peak year of 1896 when over 69 million barrels of the fruit were harvested nationally. "Apples! ", photograph by Rebekah Dickman, October 14, 2007, reprinted under a Creative Commons license. Old Colony Memorial, "News Notes", October 5, 1901, page 3.